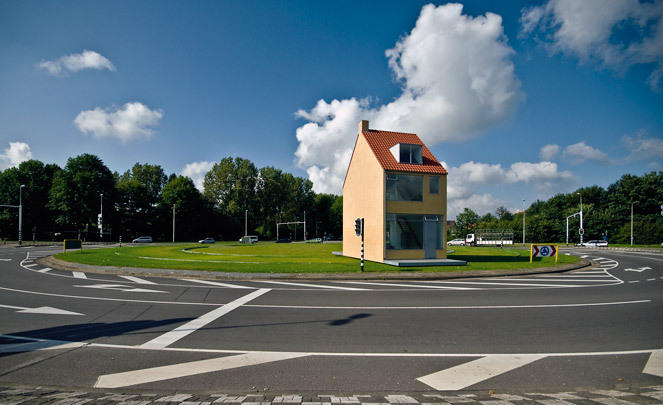 As part of an art project artist-architect John Körmeling provided a roundabout on the edge of Tilburg with a mobile version of the through-room terraced house found all over the Netherlands. Running on rails, it completes one circuit every 20 hours so that its position on the roundabout is different for each morning rush hour. With a bay measurement of 5.1 metres its dimensions match those of the original house type, though the floor-to-floor height of 3.5 metres on the ground floor is a little on the generous side. Well insulated against heat and cold according to its creator, it has a stair but no bathroom and toilet. There are also no internal partitions so as to ensure maximum full-depth sunlighting.